Transnational Environmental Law (TEL) is a peer-reviewed journal for the study of environmental law and governance beyond the state. It approaches legal and regulatory developments with an interest in the contribution of non-state actors and an awareness of the multi-level governance context in which contemporary environmental law unfolds. 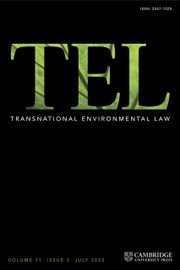 TEL has a broad disciplinary focus open to scholarly contributions covering a wide range of environmental issues and the evolving dynamics between environmental law and other legal disciplines. TEL strives for a new generation of environmental scholarship that will bridge geographical boundaries, scholarly styles and generations. A Global Environmental Constitution for the Anthropocene? Judicial Resources and the Public Trust Doctrine: A Powerful Tool of Environmental Protection? Beauty: A Lingua Franca for Environmental Law? A Rights Turn in Climate Change Litigation?